The crew went about their various tasks while on duty and, when their watches ended, sought whatever shade was available to escape the tropical sun. Several members of the crew saw some wildlife: an exhausted bird of an unknown type rested on our cook-box (or matbah) for twenty minutes before flying away; a meter and a half-long squid swam by late in the afternoon; and just before midnight, the port watch saw what they believe was a whale breaking the surface about 100 meters from the ship. Unfortunately it was too dark to identify. New crew member Tuanie Ismail has adjusted well to life aboard the Jewel of Muscat. Tuanie, whose full name is Mohamed Abdin Sam Ismail, is of Malaysian origin but his family has lived in Sri Lanka for seven generations. His grandfather served as an overseer for road construction projects and owned a large tract of land near Kandy–one of the most beautiful areas in Sri Lanka. Tuanie grew up in this idyllic landscape, taking long walks in the mountains and swimming in clear rivers. At Kingswood College he excelled in the industrial arts–especially wood-working–and won numerous awards for his creations. 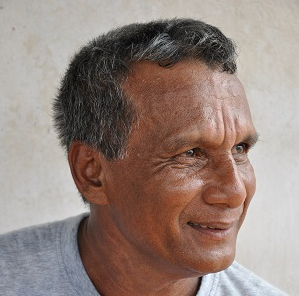 Upon graduation he served a four-year apprenticeship in Colombo as a boat builder. At the same time he studied architecture at a local university. His remarkable skills in both fields led him to a variety of jobs over the years, including building luxury fibreglass sailing yachts with extensive interior woodworking, and doing interior design work for banks and corporations. He also co-founded a boat-building company called “Touch Wood” and, years later, another company called “The Yard.” At one point he moved to Oman and worked for the Boat Manufacturing Company (BMC) in Al Khabura near Sohar. After returning to Sri Lanka, Tuanie received commissions to build full-sized boats as well as numerous models of historical wooden ships–including a spectacular five meter model of the 17th century galleon Avondster, a British ship captured by the Dutch, which sank in Galle Harbour. As a testament to his skills, many of Tuanie’s models are now on display in the National Maritime Museum in Galle, Sri Lanka. In 2009, “The Essence of Woodwork”, an international society of woodworkers awarded Tuanie its highest distinction of “Master Woodworker”. He is the only South Asian to receive this honour. Tuanie is also an experienced long distance ocean sailor. This, combined with his boat-building interest, made it inevitable that he would learn about the Jewel of Muscat. When he did, he immediately applied to join the crew, and was thrilled to hear his application was accepted. As he puts it, “Sailing aboard a 9th century wooden ship across the Indian Ocean is a once-in-a-lifetime experience. I wouldn’t have missed it for the world.” The rest of us on the crew agree with that statement, and we are delighted that Tuanie has joined us for the rest of the voyage to Singapore.